VERY Rare CONFEDERATE Memphis Civil War 1861 Newspaper w/ Publisher on the Run. (Note: additional images are located below the description). Shown is an original & historic old newspaper, offered to enhance your collectible interest: THE MEMPHIS DAILY APPEAL, Tennessee, Nov. 22, (1861) Very rare Confederate title Jefferson Davis speech This newspaper had a fascinating history during the Civil War. Memphis was a Confederate stronghold up through the Battle of Memphis on June 6, 1862, at which time the Yankees moved in and it became a Yankee city. The "Memphis Daily Appeal", dedicated to the Southern cause rallying both civilians & soldiers, it was the most important newspaper of the region, soon famously known as the Moving Appeal. " 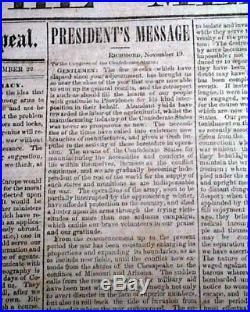 (see particulars below) The front page has nearly two columns taken up with the: "President's Message being his report on the state of the war and the Confederacy at that point. It is signed by him in type: Jefferson Davis. Other content includes: "War & diplomacy" "From the Potomac" "Provisional Government for Kentucky" "Texas Intelligence" and more. Complete in 4 pages, large folio size, archivally rejoined at the spine, various minor margin tears, a few with small archival mends. A rare opportunity for a Confederate newspaper from Tennessee. On June 6, 1862, the presses and plates were loaded into a boxcar and moved to Grenada, Mississippi, where it stayed for a few months, until approaching Federal troops threatened again, forcing a move in November 1862 to Jackson, Mississippi, where it published until May 1863, when Federal troops again arrived. By this time, the Appeal had gained notoriety among Union forces as a rebel sympathizer while it remained on the run. The next stop was Meridian, Mississippi, from where, one issue and two days later, the wandering journalists moved on to Mobile, Alabama, then to Montgomery, and ultimately to Atlanta, the economic heart of the Confederacy. Its final move was to Columbus, Georgia, where Federal forces finally caught up with it. 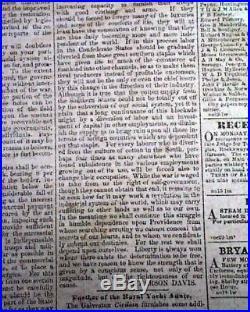 It resumed publication following the war in Memphis on November 5, 1865. During just a four year period this newspaper published in nine different cities. (credit: Tennessee State Library & Archives) This issue was published during the brief 14 month period when Memphis was a Confederate city. Please Note: All of our offerings are 100% authentic! We do not offer reprints or reproductions of any kind. They are guaranteed to be original! For this specific item, A U. The per-item additional cost for folders, portfolios, and presentation cases vary. We will still provide tracking and insure them at our expense. Please check with your country's. We have been dealers in rare newspapers for over 41 years, serve as consultants to multiple museums, and are members of the American Antiquarian Society. Timothy Hughes Rare Newspapers P. Desiring to conduct ourselves honorably in all things. Were it left to me to decide whether we should have a government without newspapers, or newspapers without a government, I should not hesitate a moment to prefer the latter. 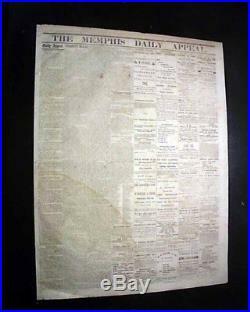 The item "VERY Rare CONFEDERATE Memphis Civil War 1861 Newspaper with Publisher on the Run" is in sale since Thursday, March 24, 2016. This item is in the category "Collectibles\Militaria\Civil War (1861-65)\Original Period Items\Other Civil War Original Items". The seller is "timhu" and is located in Williamsport, Pennsylvania. This item can be shipped worldwide.